Hi, my name is Sally! I come from California/Iowa (long story), and after many years grumbling about how terrible winter is, I courageously began my voyage back to California’s perpetual summertime after graduating high school. I only made it about three hours from home before finding myself enrolled in classes at the University of Nebraska-Lincoln. It’s been three years now and I’ve decided to stay here at UNL until I graduate with a degree in sociology. I recently started working at Nebraska Appleseed as an intern for the Health Care Access and Economic Justice Programs. 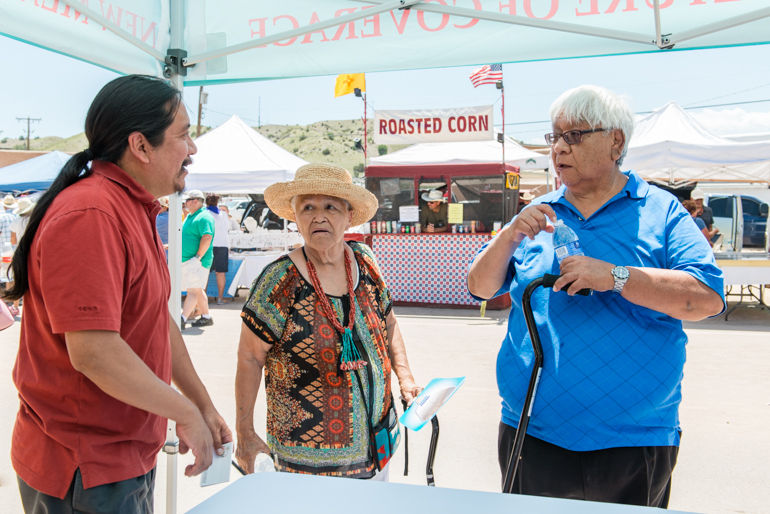 Advocate Sonny Weahkee, part Navajo and and part Pueblo, promotes health insurance for Native Americans through the New Mexico health exchange during the annual feast day at the Santo Domingo Pueblo on Tuesday, August 4, 2015 (Photo by Heidi de Marco/Kaiser Health News). Kaiser Health News recently published an article about getting the word out about coverage plans available under the Affordable Care Act. Like many people, I have been extremely out of the loop when it comes to the ACA and, subsequently, Medicaid because I didn’t think it applied to me. Along with many young adults, many Native Americans across the country also have been under this impression. The Indian Health Service (IHS) is a federal agency with a fixed budget and has been responsible for the care of Native Americans since the IHS was formed in 1995. Clinics are equipped to handle and pay for less severe health problems such as asthma and allergies, but nothing more urgent. So, it’s important to have health coverage to avoid high cost treatments in case the services needed can’t be provided at an IHS clinic. Some tribes will pay the exchange premium for members. However, members of other tribes can either access coverage through Medicaid or purchasing insurance in the Health insurance Marketplace. Insurance can pay for expensive health care off the reservation; however, it is important to stay within the network to avoid costs that are not covered by your plan. If you are a Native American in a federally recognized tribe and you have not enrolled in a health insurance plan, it is not too late—there is year-round enrollment for you! To sign up for coverage, visit healthcare.gov or call 2-1-1 to find an enrollment assister near you that will provide free help in finding an insurance plan that works for you and your family.